Former President George H.W. Bush signed Public Law 101-646, Title III CWPPRA into law in 1990 to combat the national issue of coastal land loss. Over 25 years after he left office and a week after the late President’s day of mourning, this legislation is still providing protection to billions of dollars’ worth of industry, major human settlements, and beautiful ecosystems. At 28 years of projects and counting, CWPPRA is among the longest-standing federally-funded restoration ventures in the country, as well as one of the most successful. To date, 210 projects have been authorized across Louisiana’s coastal zone to restore 100,000+ acres of wetlands. Each year of operation, CWPPRA has approved funding on multiple projects scattered across our coast. The locations of our projects can be found at https://lacoast.gov/new/About/Basins.aspx. CWPPRA projects are proposed by anyone and developed in conjunction with one of our 5 federal managing agencies and Louisiana’s Coastal Protection and Restoration Authority. The process of project selection is always a rigorous competition between candidate projects across Louisiana’s coast. Each proposal presents estimated ecological benefits, cost estimates, and a detailed plan for the desired project. At the beginning of each calendar year, Regional Planning Team meetings are held across the coast to hear proposals. The proposed projects are compiled into an annual Project Priority List (PPL). Upcoming proposal meetings can be found Jan 29-31, 2019 on our calendar at https://lacoast.gov/calendar/. Over the next year the CWPPRA Technical Committee and Task Force narrow the list of candidate projects. In December, the Technical Committee recommends their top 4 projects to the Task Force. The Task Force finally votes in January on the 4 projects they will fund for Phase I Engineering and Design. This annual cycle will complete its 28th round in late January 2019. CWPPRA is excited about wrapping up PPL 28 next month and starting on PPL 29! Be on the lookout for announcements about projects chosen for funding at the January 24th Task Force meeting. We look forward to continuing our efforts to #ProtectOurCoast! Gulfside and bayside erosion has resulted in the narrowing of Whiskey Island (and the entire Isles Dernieres chain) as the two shorelines migrate toward each other, resulting in a 68 percent decrease in average width for the Isles Dernieres. Within 100 years, the entire subaerial portion of the Isles Dernieres barrier island system is expected to disappear except for small land fragments associated with the western end of Whiskey Island and the eastern end of East Island. However, some estimates project the Isles Dernieres will disappear much earlier. Other predictions suggest that, without restoration, Whiskey Island could become a subaqueous sand shoal by 2019. Another CWPPRA restoration project, Whiskey Island Restoration (TE-27), which included placement of dredge material, vegetative planting, and sand fencing, was completed in 2000. The goal of the TE-50 project is to increase the longevity of the previously restored and natural portions of the island by increasing the island’s width. Increasing the island’s width will help to retain sand volume and elevation. Approximately 319 acres of back barrier intertidal marsh habitat, 5,865 linear feet of tidal creeks, three 1-acre tidal ponds and 13,000 linear feet of protective sand dune were created by semiconfined disposal and placement of dredged material. The sediment was dredged from a sediment source in the Gulf of Mexico near the island. The area was planted with native marsh vegetation to colonize and protect the newly-placed marsh soil. Whiskey Island, one of five islands that make up the Isles Dernieres barrier island chain, is located 18 miles southwest of Cocodrie in Terrebonne Parish, Louisiana. The island is surrounded by Coupe Colin to the west, Whiskey Pass to the east, Lake Pelto, Caillou Boca, and Caillou Bay to the north, and the Gulf of Mexico to the south. The CWPPRA Task Force approved funding for construction (phase 2) at the February 13, 2008 Task Force meeting. Construction began in March 2009 and initial construction was completed in November 2009.Vegetative plantings were installed at the project site in June of 2010 and October 2011. This project is on Project Priority List 13. * Problems: New Cut was first formed in 1974 when the eastern end of Trinity Island was breached during Hurricane Carmen. This breach was further widened by Hurricane Juan in 1985 and Hurricane Andrew in 1992. — The Isles Dernieres shoreline is one of the most rapidly deteriorating barrier shorelines in the U.S., exhibiting a pattern of fragmentation and disintegration. — With regard to long shore sediment transport systems or the movement of beach material by waves and currents, the islands have ultimately become sources of sediment themselves leading to an ever-decreasing volume of sediment. * Restoration Strategy: The purpose of this project was to close the breach between Trinity and East Islands through the direct creation of beach, dune, and marsh habitat. This project also lengthened the structural integrity of eastern Isles Dernieres by restoring the littoral drift by adding sediment into the nearshore system (restoring about 8,000 linear feet of barrier island). * Location: New Cut is the breach between East and Trinity Islands in the Isles Dernieres barrier island chain. The cut is bordered on the north by Lake Pelto, on the west by Trinity Island, on the east by East Island and on the south by the Gulf of Mexico, in Terrebonne Parish, Louisiana. * Progress to Date: A rock dike and approximately 2 million cubic yards of dredged material reconstructed a dune and marsh platform to protect the shoreline from erosion and to restore interior marsh lost from subsidence and saltwater intrusion. Phase 2 (construction) funding was initially approved at the January 2001 Louisiana Coastal Wetlands Conservation and Restoration Task Force meeting and additional funds allocated in 2006 to account for change in borrow site and post-hurricane increased construction costs. Dredging was completed July 2007. About 8,000 linear feet of barrier island was restored by placing approximately 850,000 cubic yards of material. New Cut was closed through the construction of a dune platform matching the dune elevations on the east and west, strengthening the connection between East and Trinity Islands. Nine species of native barrier island vegetation were planted along with over 17,000 linear feet of sand fencing. No maintenance is anticipated over the 20-year design life. * This Project is on Priority Project List (PPL) 9. Established in 1986, the Louisiana Artificial Reef Program takes advantage of obsolete oil and gas platforms which were recognized as providing habitat important to many of Louisiana’s coastal fishes . Participating companies donate materials, and 1/2 of their savings into the Louisiana Artificial Reef Trust Fund. In 1999, the Louisiana Artificial Reef Program created the World’s largest artificial reef from the Freeport sulfur mine off Grand Isle, Louisiana. One of the (5) main objectives of the Coastal Master Plan, includes the restoration of coastal habitats. Programs such as the Louisiana Artificial Reef Program, provide fisheries habitat in the form of converted rigs, provide support to CWPPRA and other partners funding coastal restoration projects. McDonough, Mike. 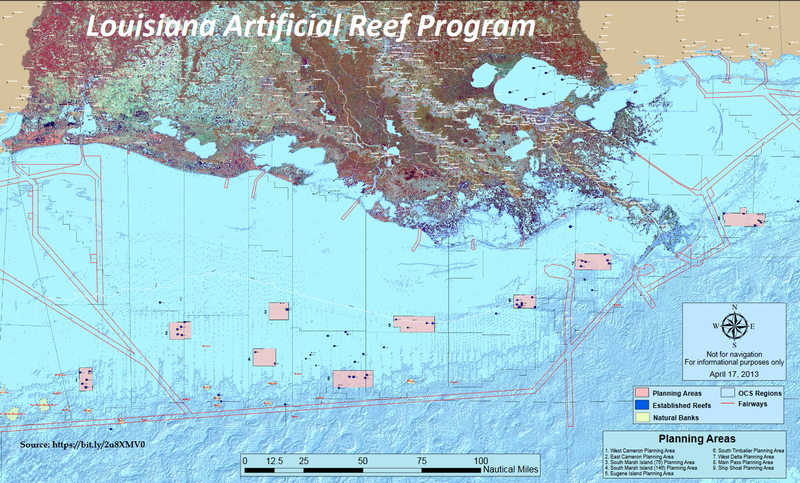 The Louisiana Artificial Reef Program. Available: http://www.wlf.louisiana.gov/fishing/artificial-reef-program [July 10, 2018]. Coastal Louisiana boasts an impressive number of state parks that span a variety of ecosystems. Many of the parks contain salt or fresh wetlands, and each is unique; cypress-willow-tupelo swamps, pine forests, cordgrass marshes, and grass-dominated prairie, to name a few. Tourists are very fortunate to have so many different choices when planning their trips. For example, hiking and camping in a bottomland hardwood forest can be found at Chicot State Park, beaches and boating can be done at Grand Isle State Park, and a mix of fresh and salt water fishing can be found in Bayou Segnette State Park. Many of these parks offer a birding guide to help with identifying migratory songbirds, wading birds, and many others. A complete list of Louisiana State Parks can be found at https://www.crt.state.la.us/louisiana-state-parks/parks/index. As impressive as the state parks may be, they are not the only parks in Louisiana. Louisiana is home to 23 National Wildlife Refuges, 8 National Parks, and 1 National Forest, among other attractions. CWPPRA has several projects within national refuges that have helped to maintain the appeal of our natural splendor to visitors. Through hydrologic restoration which helps freshwater move into coastal areas, marsh creation to increase existing land, and shoreline protection to combat erosion, we hope to preserve the areas like Cameron Prairie NWR, Big Branch Marsh NWR, and Rockefeller State Wildlife Refuge in a way that they can be enjoyed for many years to come. With such vibrant ecosystems, it is no wonder . According to USGS-land loss analysis, much of the southern and western shorelines of Lake Lery and the surrounding wetlands were heavily damaged in 2005 by Hurricane Katrina. In the years following this storm, wind induced waves within the lake have begun to cause further damage to the lake’s shorelines. Currently the shorelines have become so damaged that the interior emergent marshes that are still intact are being exposed to the damaging waves. This has caused an increased loss of emergent marsh habitat. Even with the benefits of the Caernarvon Diversion Structure, without some type of restoration in this area, these marshes may not be able to fully recover. This is a marsh creation and shoreline restoration project. The marsh creation aspect of the project will have a hydraulic dredge extract material from the Lake Lery water bottom and pump that material into contained marsh creation cells located south and west of the southern and western Lake Lery shorelines. This will create and/or nourish approximately 642 acres of intertidal intermediate marsh. The shoreline restoration component of the project will have a barge-mounted dragline excavating material from the bottom of Lake Lery and placing that material along the southern and western shorelines. This restored shoreline will have a 50 foot crown width and be built to a height considered high intertidal marsh. This project received Phase II funding in January 2012. Construction began in the spring of 2015 and is expected to be complete in the summer of 2018. All marsh creation is complete. Earthwork and vegetative plantings associated with the lake rim embankments are complete. There are ongoing discussions regarding erosion concerns along lake rim embankments. This Project is on Project Priority List 17. Fishing has been a part of Louisiana life since the earliest inhabitants settled the area. Settlers hunted and fished in the abundant water bodies of Louisiana for survival. – In today’s society, Louisiana fisheries have evolved into powerhouse contributors to the economic well-being of the state of Louisiana and the nation. The commercialization of Louisiana’s fishing industry occurred during the antebellum era between 1812 and 1860 as New Orleans became one North America’s boom towns . Today, Louisiana fisheries are just as important to the people and state. Thanks to federal, state, and local programs, Louisiana’s traditional fishermen still have the ability to provide quality seafood and recreation. Today, Louisiana fisheries are just as important to the people and state as it was then. Thanks to federal, state, and localized programs Louisiana traditional fisherman still have the ability to provide quality seafood and recreation. Almost 70 percent of the seafood harvested off the Gulf Coast is consumed by Louisianans. Today, Louisiana has numerous programs that help keep the seafood industry successful, sustainable, and environmentally-minded. Programs like Louisiana Fisheries Forward, funded by the Louisiana Department of Wildlife & Fisheries and Sea Grant, provide guidance for Louisiana fishermen, harvesters, docks, and processors . Their website provides access to a digital library on best practices in the commercial fishing industry (videos, regulation guidelines, safety, responsible fishing, sustainability and business basics). Another program, the Lafourche-Terrebonne Direct Seafood Program was launched to help increase fishermen income and support social interactions with the public. Funded by the Gulf States Marine Fisheries Commission, the program assists locals and visitors in purchasing fresh local seafood directly from the fishers online or with a smart phone . Research by university scientists and fisheries resource managers focuses on the challenging issues affecting our coast and fisheries . The Louisiana Department of Wildlife and Fisheries and Louisiana Sea Grant apply specific research initiatives to support sustainable and healthy practices to the fishing industry. For example, current research on finding a sulfite-free alternative that effectively treats black spot in shrimp will allow dealers and processors to use ‘chem-free’ labeling . Black-spot in shrimp is a harmless discoloration in shrimp caused by a system of enzymes that are naturally present in shrimp . This discoloration can increase when exposed to air for too long, and deters consumers from purchasing shrimp as their color darkens . Traditionally, sodium sulfites were used in preventing black spot in shrimp ,but its known now that a small population of people are allergic to sodium sulfites . Research by the Louisiana Sea Grant & LSU AgCenter provides an alternative enzyme-based product to prevent black spot in shrimp. This alternative increases the marketing ability for fisheries and safety for those allergic to sulfites . Advanced mapping systems by zone and seafood type can be pulled from the Louisiana Wildlife & Fisheries website and sorted by recreational and commercial fishing. The CWPPRA Watermarks Issue #55 notes, “For over 50 years, almost every document addressing Louisiana’s land loss, mentions ‘wetlands and the fish dependent thereon” . CWPPRA uses a Wetland Value Assessment (WVA) to determine quality and quantity of fish and wildlife habitat. Together, groups like the Louisiana Department of Wildlife and Fisheries along with CWPPRA are working together to restore coastal Louisiana where people and wildlife have lived for generations.